Reading Transport Fleet List: 163 has returned from repaint into pink at Renault Trucks and is shortly to be released for driver training and entry into service. It appears to be registered RE63 EOH, but this is still be be confirmed. Courtney Buses Fleet List: YJ62 FCC has been repainted mustard for new route 9 from 2nd February. Thames Travel Fleet List: An additional Renault van is YE10 RUC. Thanks to Ralph Adams for this. News Page: Scania Demonstrator with Reading with photo of 400. Thanks to Bob Morley for this photo. Reading Transport Fleet List: Two of the new Streetlites are registered RE63 EOF/G. Both these and 312 are at Hants & Dorset Trim for repaint. Thanks to Mike for this. 842 has been repainted into the new Sky blie livery, returning to service by 18th. Thanks to Jase Wolf for this. 844 appears to be under preparation next rather than 843. Thanks to Brian Coney for this. Courtney Buses Fleet List: KX58 BGY and YJ55 BLV are to leave the fleet shortly. Thanks to Glenn De Sousa for this. First Berkshire Fleet List: Bracknell 40826 has been withdrawn at Slough, with 42508 transferring to Bracknell from Hampshire in its place, entering service today. 20811 entered service on 13th. Thanks to Mat Wooll for this. Thames Travel Fleet List: Unusual Scania N94 OmniTowns 451-4 are expected to transfer to Plymouth Citybus shortly following the end of Bracknell operations. Thames Travel Fleet List: 101 remains in service. Thanks to Paul Blackman for this. 701 has gained a MegaRear for SJE. Thanks to Malcolm Crowe for this. Weavaway Travel Fleet List: YX63 ZVO/P/R/S arrived on 14th and were in service by 17th. ZVJ/K/L are currently working from Greenham but will transfer to Didcot shortly. ZVM/N/O/P/R/S are currently at Didcot but ZVP/R/S will transfer to Greenham shortly. AE57 FKA/B and YJ59 GHO/U departed for Plaxton (dealer) on 14th. Thanks to David Wilder for this. Oxford Bus Company Fleet List: Salisbury Reds 1571-8 have gained Brookesbus fleetnames instead of City along with Brookesbus adverts in their frames, and green Southern Vectis 1579-84 have gained City lettering. Thanks to Graham Low for this. 1579-84 entered service on 17th. Thanks to Richard Sharman for this. Stagecoach in Oxfordshire Fleet List: 36765 has gained a MegaRear for Burns Pet Food. Thanks to Malcolm Crowe for this. Stagecoach in Warwickshire Fleet List: Nuneaton 33397 has gone into reserve. Thanks to Keith Wood for this. Fleet Buzz Fleet List: Three Olympians transferred from Stagecoach South from 5th January, the third being 16282. 33306, 33307 and 33382 went into reserve the same day. News Page: Thames Travel Exit Bracknell with photos of First Berkshire 64021 and Courtney SN63 VTY. Thanks to Mat Wooll and Graham Low for these photos. Courtney Buses Fleet List: The new temporary Solo SRs are YD63 UZE/F rather than YJ62 UZE/F as originally reported. Thanks to Ray Pettit for this. 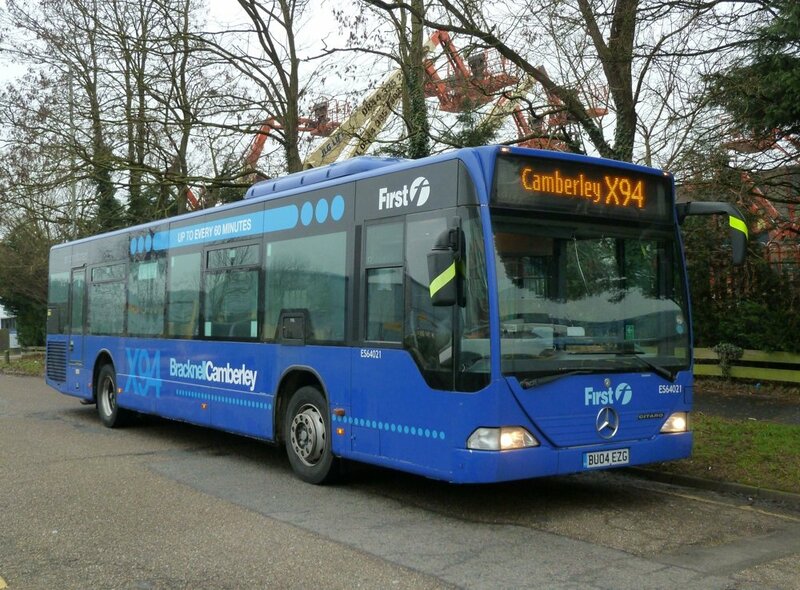 First Berkshire Fleet List: Dennis Dart SLFs 40826, 40956 and 42113/4/5 have transferred from First Hampshire to Bracknell for additional tendered services, arriving on 7th. 20811 entered service on 6th and 20810 on 7th. 23014 was withdrawn on 6th and transferred to First South West on 9th. Thanks to Mat Wooll for this. Reading Transport Fleet List: 400 arrived on 20th. Thanks to Brian Coney for this. 312/3 are to be Blackberry and Apple. Thamesdown 383 returned on around 6th December. First Berkshire Fleet List: 64020/1 have transferred to Bracknell and gained temporary X94 branding on their blue livery, pending repaint into Beeline livery later in the year. Thanks to Mat Wooll for this. 23014 has transferred to First South West, in use on test on yesterday still in RailAir livery. Thanks to David King for this. 23011 is also in the process of transferring there. Thanks to Dave Godley for this. 20810 was in service by 10th. Thanks to Martin for this. 40721 returned to Slough rather than Bracknell on return from loan to Hampshire. Thanks to Brian Coney for this. 64018 transferred to Bracknell as planned at some point. Fleet Buzz Fleet List: 16588 has also transferred from Stagecoach South. The vehicles run the 82, 325 and 414, doing the morning on one route and the afternoon on the other. Thanks to Paul Blackman for this. Reading Transport Fleet List: The first three of the new Streetlites have been delivered in dealer white and are about to be repainted at Renault Trucks prior to entering service. A number of the new Enviro300SGs are being completed on the production line and the first five appear to be 430-4 which will be lime green for a relaunched Lime 2 commencing from 9th March. The whole batch will be allocated 2014 registration plates. Reading Transport Former Vehicle Fleet List: The demonstrator will be present for several weeks to provide cover for warranty work, and will be used on Greenwave in the event that vehicles are unavailable (presumably to avoid fitting a cash vault). It is allocated temporary fleet number 400. First Berkshire Fleet List: 69930-34 are registered BJ63 UHZ, UJV/W/X/Z. Thanks to Glenn De Sousa for this. Courtney Buses Fleet List: The new temporary Solo SRs have arrived and are registered YJ62 UZE/F and KP63 RHE. Thanks to Glenn De Sousa for this. Stagecoach in Warwickshire Fleet List: Nuneaton 33459 has been withdrawn for disposal, being replaced by 34593 from Northampton. Rugby Megabus 53029 has become a training vehicle with tow bar for trailers, whilst 53643/4 have transferred to Glasgow. 47032 is now in reserve at Leamington. 16677, 22460, 22920, 33453, 33910, 53011, 53017 and 53034 have been sold and will be collected shortly. Reading Transport Former Vehicle Fleet List: ADL Enviro300SG demonstrator YT13 YUK was in use on 30th December. The period of load is unknown as yet. Thanks to James Cusworth for this. First Berkshire Fleet List: 69930-34 have entered service. Fleet Buzz Fleet List: 16590 appears likely to be a transfer from this week for new school route 414. Thanks to Paul Blackman for this. Stagecoach in Oxfordshire Fleet List: 22052 has transferred to Stagecoach West, reserve 22925/26/33/34 are expected to transfer to Stagecoach Yorkshire shortly and 22768-71 have gone into reserve. Thanks to Ralph Adams for this. 22766 returned to service from reserve some time ago and withdrawn 47433 was sold sometime last year. Stagecoach in Warwickshire Fleet List: 35180 has now been repainted, loosing it's X17 branding in the process. 35177 is thought to be in use at Nuneaton and has presumably been treated similarly. Thanks to Keith Wood for this.